Here we explain the causes, significance, and cures for condensation or "sweating" on plumbing system components like pipes, water tanks, and toilets. A certain amount of moisture condensation on building plumbing systems is normal in areas of warm humid weather and cold or chilly incoming water supply. But as we explain here, excessive condensation on plumbing systems can cause costly problems in buildings. The articles at this website will answer most questions about plumbing drain, waste, vent, water supply & septic systems. Our sweating toilet tank photo illustrates where condensation may form on the tank of a toilet that is in frequent use during hot humid weather, or on a toilet whose flush valve leaks, allowing the toilet to "run" continuously. Condensation, the collection of airborne moisture on cool surfaces can happen anywhere in the plumbing system where components are cooler than surrounding, moist air. Common places where we see condensation or "sweating" include toilet tanks, cold water pipes, and water storage or water pressure tanks. Carson Dunlop Associates in their Home Reference Book point out that in some homes, the cold water piping is insulated to avoid sweating of pipes. On a warm humid day, cold water running through a pipe will cool the adjacent air, causing condensation on the pipes, tanks, toilets etc. Our photo above shows a close-up photograph of condensation on the exterior of a steel water pressure tank.. This ‘sweating’ can be annoying, and if allowed to continue, can damage ceilings, floors, furniture or storage below. Condensation that drips off of these locations can even lead to building rot, insect attack, or to the need for a costly mold cleanup job. See TOILET RUNS CONTINUOUSLY for advice on fixing condensation on running toilets and on the cold water pipes that supply toilets or other leaky plumbing fixtures. So Do Water Pipes Actually "Sweat" in buildings? No. Pipes and tanks don't literally "sweat". "Water pipes do not "sweat" as people say - water is not exuding out of pores in the pipe. Water is condensing from moist air onto the surface of the cold water pipe. Insulate your cold water pipes to avoid condensation and drips onto the floor. What people popularly refer to as "sweating pipes" really is airborne moisture that is condensing out of humid air onto a cool pipe, tank, or other surface. Where Does Condensation Occur on Plumbing & Mechanical Systems? see CONDENSATE HANDLING for HVACR systems for a discussion of where normal A/C condensate should be accumulated and how it is drained away. Cold water supply piping: Condensation can occur on all types of cold water supply piping materials, but we see the most significant condensation on metal cold water pipes (copper, galvanized steel) and a bit less on plastic piping, probably because the plastic does not so quickly conduct water temperature to the outside of the pipe. Our photo (left) illustrates that "sweating" cold water pipes can be a serious hazard. These cold water pipes are dripping condensate (red arrow at left) right into the electrical panel (down-pointing red arrow at left), risking corrosion of the circuit breakers and other electrical components. at CORROSION in ELECTRICAL PANELS. Copper and some cast iron plumbing drains: condensation may occur on metal drain/waste/vent piping if there is a cold water plumbing fixture leak that keeps sending cold water through the building drain piping. Running plumbing fixtures, particularly toilets that are either in very frequent use or toilets that have a leaky flush valve or defective fill valve. What Causes Condensation on Plumbing System Components like Pipes, Tanks, Toilets? Why does water condense on your cold water pipes overhead in the basement before it condenses on the steel Lally columns supporting your main girder? It's because the cold water pipe surfaces are colder than the Lally column surfaces exposed to the same moisture-laden air. When cold water (at 40 deg.F.) is running through the water pipe, the pipe surface is cooled to a lower temperature (40 deg.F.) than that of the Lally column (perhaps 55 deg.F. or higher in a typical residential building basement). When the temperature of air reaches the dew point (a function of the combination of a particular air temperature and the amount of moisture in the air), moisture condenses out of the air onto nearby cooler surfaces. See DEW POINT TABLE - CONDENSATION POINT GUIDE for more details. It looks like sweat, but it's not. It's condensation. What is the Significance of Condensation for Diagnosing Building Conditions? Running toilets: if a toilet fill or flush valve is leaky the toilet may run continuously or intermittently. A telltale sign that a toilet is running is the observation of water rippling in the toilet bowl long after the toilet was flushed. The condensation visible on the toilet tank in our photo (Left) was present even when the toilet had not been flushed for 24 hours, leading to an investigation and cure of a leaky toilet flush valve. But some toilet leaks are slow and subtle and may not be so visually obvious. But if a toilet is leaky or running, in warm humid weather you may notice that the toilet tank is wet with condensation even when the toilet has not been flushed for several hours or more. Toilet tank condensation, if chronic and significant, can lead to bathroom floor tile damage, subfloor rot, and even attack by wood destroying insects or mold. See TOILET RUNS CONTINUOUSLY for details. Hidden water supply pipe leaks: similar to the case above, a plumbing fixture with a running faucet is pretty obvious. 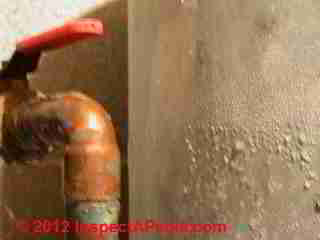 But a hidden supply piping leak may be dripping or leaking into a building wall cavity or even outside or underground. If the cold water pipes in your building are wet with condensation even though you think no water has been running for hours, there may be a hidden plumbing leak. A great time to check for this condition is on first arising in the morning, before plumbing fixtures have been used. Our photograph of stains on an interior wall (left) is an example of indoor stains caused by moisture on building plumbing pipes. Private well piping or well problems: intermittent cycling of a well pump when no water is being run is often a sign of either a running plumbing fixture in the building, or a leak in the well piping itself. If you see condensation on water piping entering the water pressure tank and hear intermittent well pump cycling for no apparent reason, further investigation is warranted. and WELL PIPING LEAK DIAGNOSIS. Indoor stains in ceilings or walls, flooring damage, and even hidden mold are all problems that can be caused by hidden plumbing leaks or by condensation on cold water piping where it passes through building cavities. For at least two reasons, that of energy efficiency and to prevent moisture drips and possible mold growth inside basement ceiling cavities, you might want to insulate your hot water and heating pipes in a basement as well, though in some conditions we are so desperate to warm and dry a problem area that we deliberately leave the hot water and heating pipe insulation off of those pipes so that we can steal some of their heat to warm and dry an area. Carson Dunlop Associates suggest that if a basement is to be finished, the cold water piping above the ceiling should be insulated. Foam insulating tubes that snap around plumbing piping are widely available and work very nicely for this purpose. We advise against wrapping pipes in fiberglass insulation. Insulate the Water Pressure Tank? Where a water pressure tank is located in a finished basement or similar area, having puddles of condensate on the floor around the water tank can be a problem. If you have made sure that there are no plumbing leaks or well pump short cycling problems that are keeping the water tank cold and subject to condensation too much of the time, insulating the water tank with an insulation blanket may be helpful. Watch out: we have inspected properties where the water pressure tank was located in a finished basement, enclosed in a closet, and surrounded with fiberglass insulation. Wetting fiberglass insulation is inviting a hidden mold contamination problem. Insulating such "closets" with solid foam insulation may be a more mold-resistant approach. See INSULATION MOLD CONTAMINATION TEST for details. Some toilet models currently sold include an insulated toilet tank and may be appropriate if you live in an area where weather is hot and humid for much of the year, as toilet tank condensation can be a problem even if the toilet is not leaky or running. But before going to the cost and trouble of changing out a toilet tank or trying to insulate the exterior of the tank, make triple sure that your toilet is not leaky and running. Find and fix running toilets, hidden plumbing leaks, well piping problems or municipal water piping problems that we listed earlier. Our preferred method for reducing condensation on plumbing pipes, tanks, toilets indoors is to reduce the level of indoor humidity to an appropriate level using either a local portable dehumidifier, or the building's central air conditioning system. See HUMIDITY LEVEL TARGET for details. In some circumstances increasing the air circulation around a condensation-prone water tank can reduce the total quantity of condensation, at least if the condensation is from normal use and not from a plumbing leak. In some commercial installations and in a few private homes where condensation people add heat where spot condensation is a particular problem. In gravity toilets that store 3 or more gallons of water in the tank, the incoming 1.6 gallons of cold water is tempered by the retained water in the tank. In pressure-assisted toilets, the incoming water resides in a small tank within the larger porcelain tank, so the porcelain tank is not chilled. However, condensation can form around the inner tank, leading to mold growth. One approach to avoiding "sweating" or condensation problems with older toilets is to add special foam insulation inserts inside the tank. These may not work with low-flow designs, however. Also this does not prevent dripping from the bowl or water supply line. Where the problem persists, consider added an anti sweat valve (Beacon Valves) that tempers the incoming cold water with a little bit of hot water to bring it up to room temperature. Continue reading at MOISTURE PROBLEMS: CAUSE & CURE or select a topic from closely-related articles below, or see our complete INDEX to RELATED ARTICLES below. 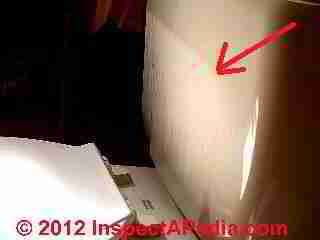 CONDENSATION or SWEATING PIPES, TANKS at InspectApedia.com - online encyclopedia of building & environmental inspection, testing, diagnosis, repair, & problem prevention advice. Also see MOLD on TANKS, WATER, OTHER for photos of mold growth on water pressure tanks and comments on where the health hazards may lie.